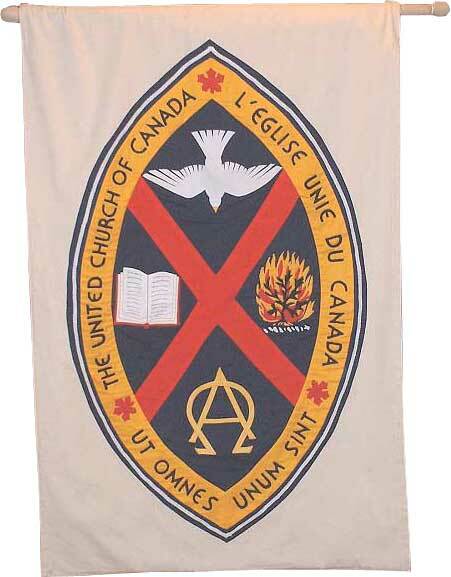 Over the years Wilmot United Church has enjoyed a number of attractive and meaningful tapestries that have been hung in the sanctuary at appropriate seasons of the church year. This page contains photos of those that have been catalogued as of February, 2007. Click on each photo to see a larger image. 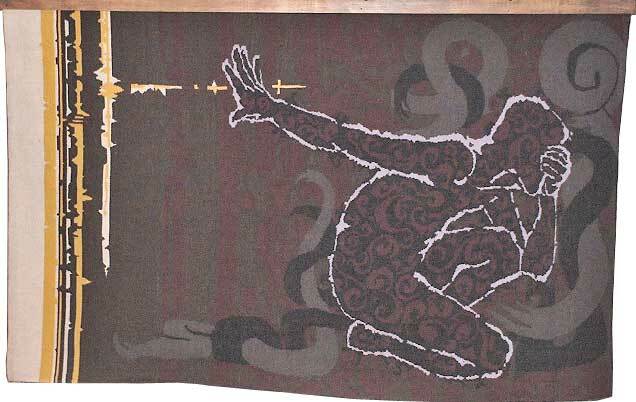 Additionally, here is a slide show of the tapestries displayed below. 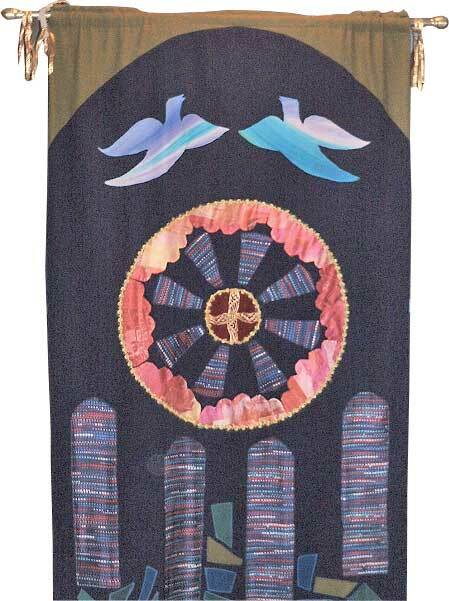 The candles on this tapestry were lit at the same time as the candle in the sanctuary using red flames and the last one was a silver or bright colored one. The candles of the Advent wreath – four purple ones in Advent and one white Christ candle at Christmas – ascend this design by Carolyn Atkinson. Each is flanked by white doves, the dove being the symbol for the Holy Spirit. 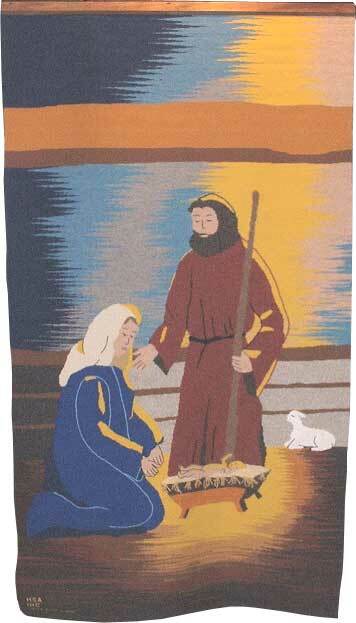 The background color for the tapestry is blue, the alternate colour for Advent. 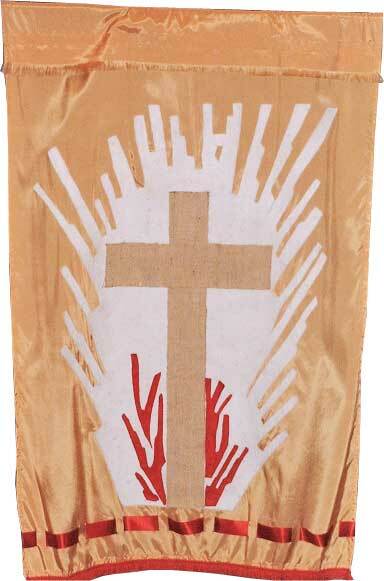 In this design for Pentecost the New Testament’s three major images for the Holy Spirit are combined. 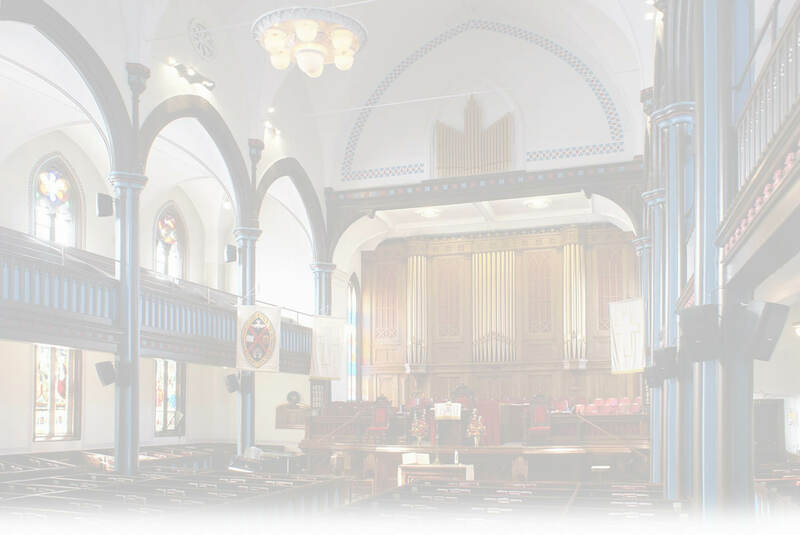 The Church was born at Pentecost with a sound like a mighty rushing of wind, and the appearance of tongues of fire upon the disciples [Acts 2:1-3]. 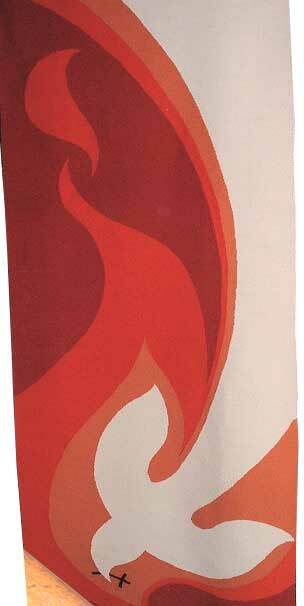 The design here shows the flames swirling upward in the wind. 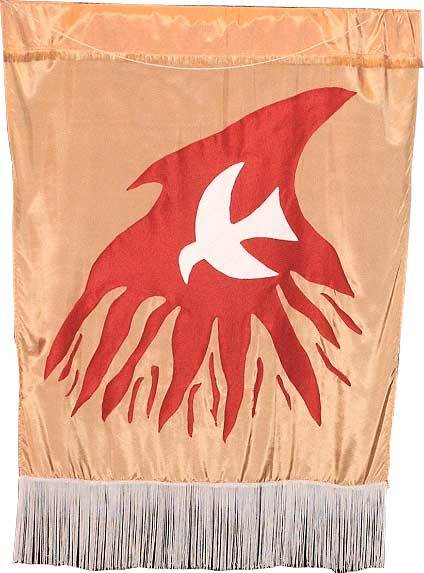 But since the Spirit in the Church is the same Spirit of Jesus’ ministry, the dove, which alighted on Jesus at his baptism, is combined with the flames. It bears a Cross to remind us that inspiration by the Spirit and self-giving love are inseparable. The design combines the Star, which represents the Light of the World, with the Christ Candle, on which is the “Chi-Rho” the first two letters of “Christ” in Greek. Intersecting rays from both the flame and the star form cross patterns. 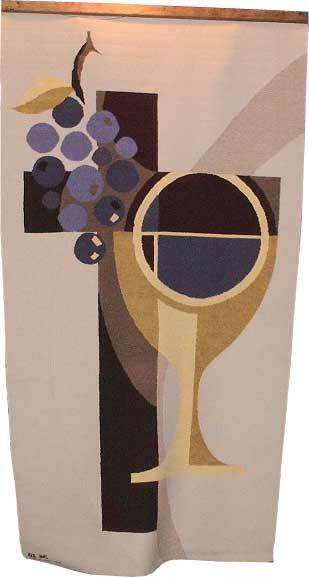 The design superimposes on a cross the cup of blessing, and the grapes from which the wine is pressed. 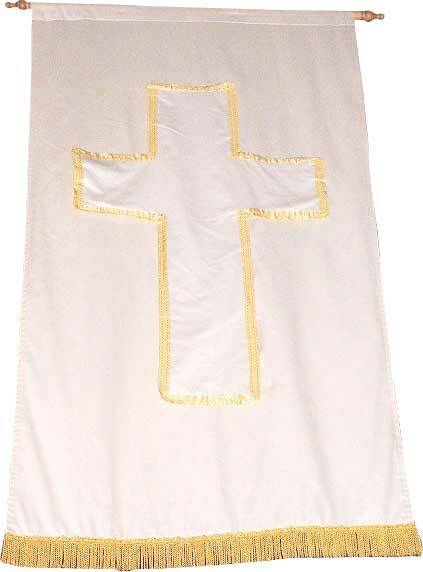 These have always symbolized for the Church Christ’s life poured out for us. This is my blood of the covenant, which is poured out for many for the forgiveness of sins.” [Matthew 26:28]. 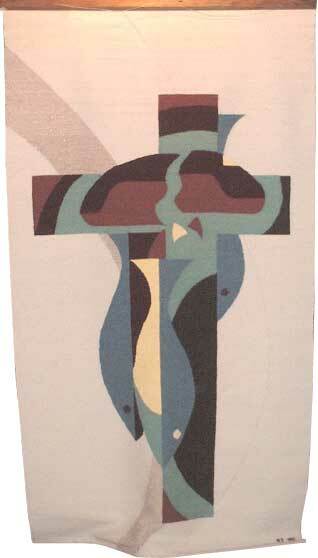 The design superimposes loaves and fishes on a cross. The fish symbol was the signal of secret recognition among the earliest Christians; and bread is also central to the Lord’s table. “I am the bread of life.” [John 6:48]. 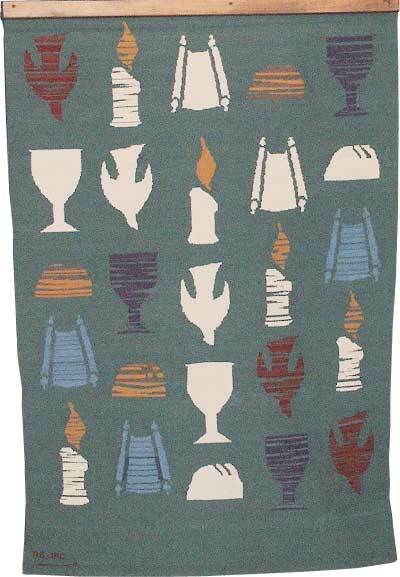 The elements in the design are the central symbolic moments of the church’s life – bread and cup of communion, the Torah scroll representing the Bible, and the Christ candle. These complementary designs are intended to be hung together to express a theological theme: our constant choice in life is between the state of grace, between the misery of alienation from God and the joy of life lifted towards God. These designs were intended to be frankly allegorical. Sin is visualized as a human form, hunched in upon itself, hiding its face in grief. 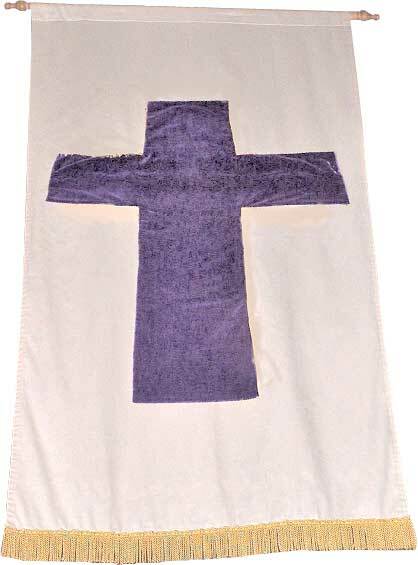 It waves away the approach of the Divine light which manifests itself in the surrounding darkness in the shape of a Cross. The serpentine shapes interpersonal, external to us. They are echoed by contorted shapes within the figure which represent the personal internal forces in us that alienate us from God. 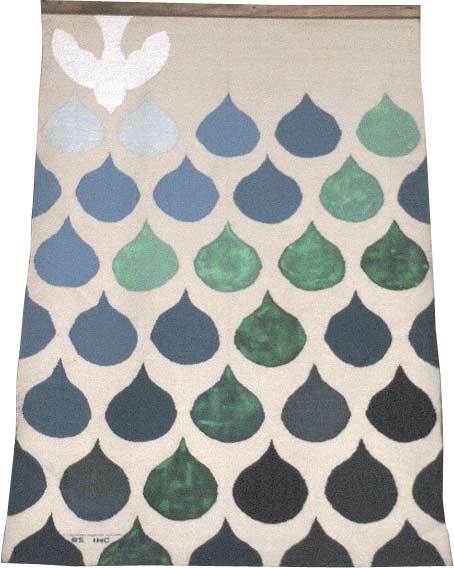 The tapestry is designed to be viewed at different levels. From a distance, we see only a figure against a dark background. Up close, the eye can resolve the details of the distinction between the forms inside the figure and outside. This parallels the way that only with close examination of ourselves can we begin to grasp the nature of our distance from God. 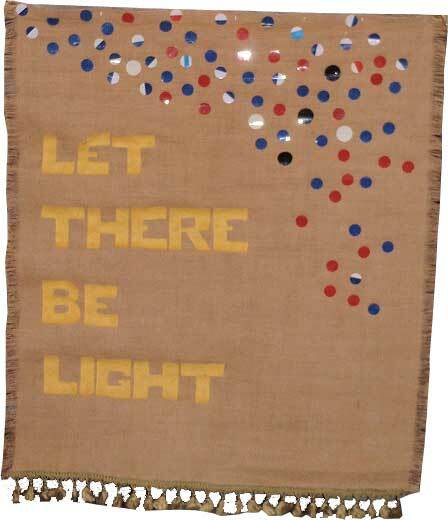 The rays of light – three in number (for the Trinity) – penetrate the figure in order to lift it. Once again, the Cross is present as part of the process by which humanity is restored to its intended place in the glory of God. This traditional design shows Joseph, Mary and the infant Christ in a stable, with a Bethlehem star blazing in the deep blue of the night sky. 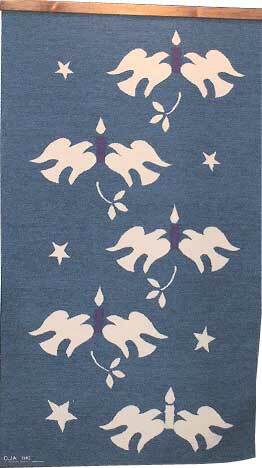 The effect is tranquil and serene – a good visual for a night when little persons are so excited!! 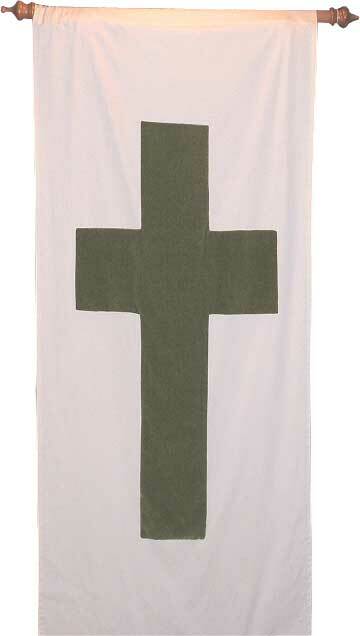 The design combines the Dove, symbol of the Holy Spirit, with water drops, among which a green Cross is figured. The fabric was purchased for these crosses in December 2006 and attached to fabric in 2007 by Ellen Sherren and Carlinda Daigle. 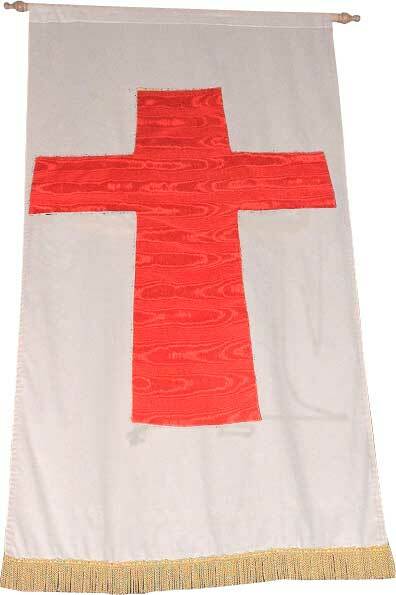 Purpose: This used to hang outside of the office of Rev. Cliff Moase at the end of the hallway. 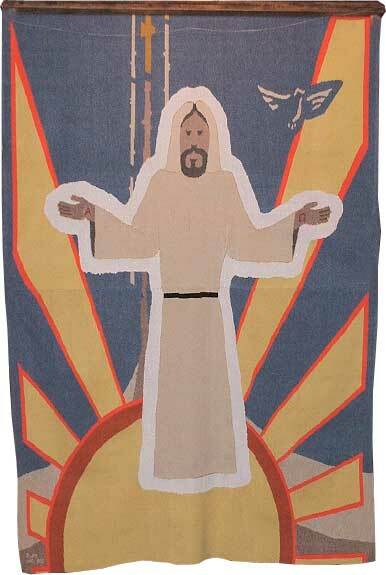 Donated: Before the Cragg Tapestries in 1980s. 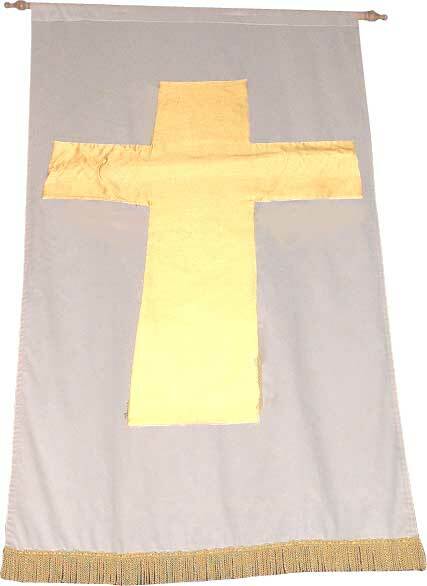 Purpose: This was presented to the Right Reverend Peter Short in recognition his induction as the 38th Moderator of The United Church of Canada in August 2003. 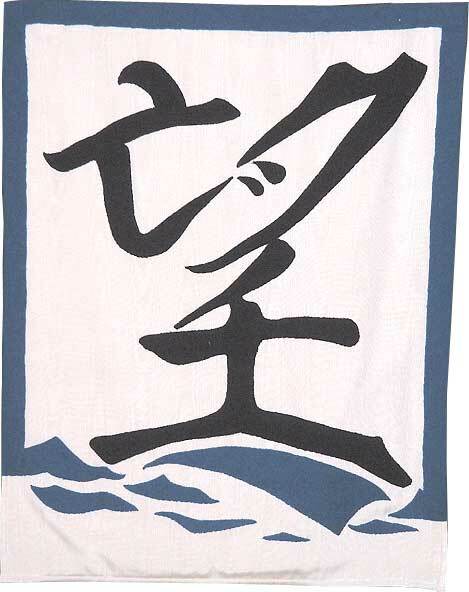 The inspiration for the use of Japanese characters came from retired minister the Rev. Hiraku Iwai of Saskatoon. Artist Paula Williams (from Kentville, Nova Scotia) then took the three components of the Japanese word for "Hope", and incorporated a blue border (to represent the Atlantic Ocean) and a traditional Atlantic dory to create the logo for the General Council. For a more comprehensive treatment of the theme and logo, see (especially page 4) of 38th General Council NEWS. 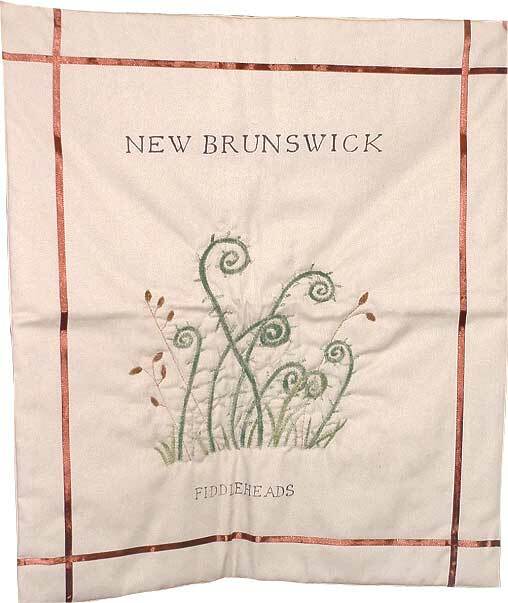 Purpose: It was suggested to use when we have fiddlers or on New Brunswick Day in August.